Ödemeye ilişkin tüm masraflar, gönderen tarafından karşılanmalıdır. Hesabımıza, ödenmesi talep edilen miktarın tamamı gönderilmelidir. 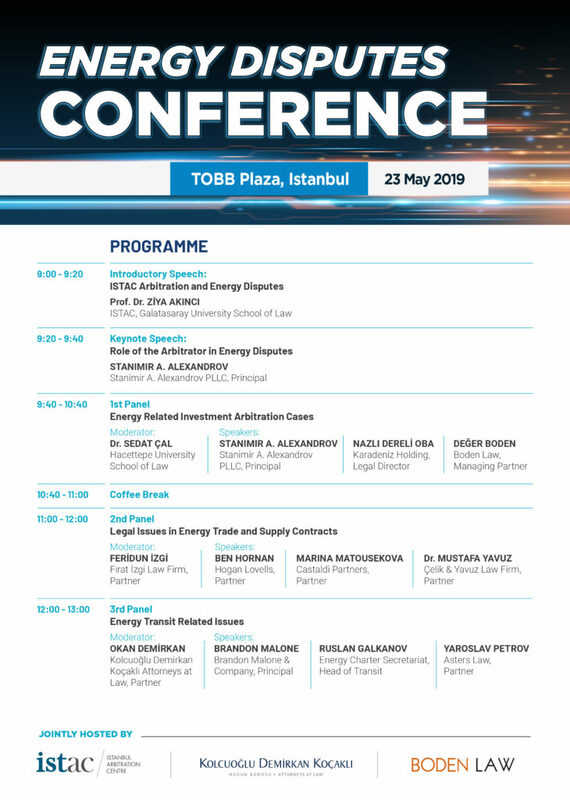 We are pleased to announce that as ISTAC’s Energy Commission we are organising the first “Energy Disputes Conference” of ISTAC jointly hosted by Boden Law and Kolcuoğlu Demirkan Koçaklı Attorneys at Law which will take place in Istanbul on 23 May 2019. The panels will consist of speakers from common and civil law backgrounds, including Stanimir A. Alexandrov, Dr. Sedat Çal, Nazlı Dereli Oba, Değer Boden, Feridun İzgi, Ben Hornan, Marina Matousekova, Dr. Mustafa Yavuz, Okan Demirkan, Brandon Malone, Ruslan Galkanov, Yaroslav Petrov. The Conference is intended to be practical in its approach, it will be of interest to lawyers, general commercial lawyers, arbitration practitioners, in-house counsel, experts and business people. This Conference will be conducted in English. No simultaneous translation will be offered. Please note that complimentary seats are offered on a first-come-first-served basis and at the organizers’ discretion. Within a reasonable time, applicants will be notified by email with the result. The registration fee includes coffee breaks. Attendance is limited due to the capacity of the venue. All applications are accepted on a first come, first served basis.